Preheat the oven to 400 degrees Fahrenheit and line a large, rimmed baking sheet with parchment paper or a silk pad. Use a very sharp chef’s knife to stand the squash upright on a stable surface and carefully slice through it from top to bottom to divide it in half. Use a large spoon to scoop out the spaghetti squash seeds and discard them. Drizzle the insides of each squash half with 1 tablespoon of olive oil and rub it all over the inside. Sprinkle salt and pepper lightly over the interiors of the squash, then place them cut-side up on the prepared baking sheet. Once the squash is done baking, fluff the interiors with two forks to make the insides spaghetti-like. Preheat the oven to 400. Note that you can cook meatballs in the same oven as the squash. Just be aware of the difference in cooking times. In a small sauce pan, sauté the onions in 1 tablespoon of olive oil until translucent. Add the garlic the last minutes of cooking. Let cool. Combine in a mixing bowl, the onions, garlic, prosciutto, almond flour, egg, parsley, oregano, basil, salt and pepper. 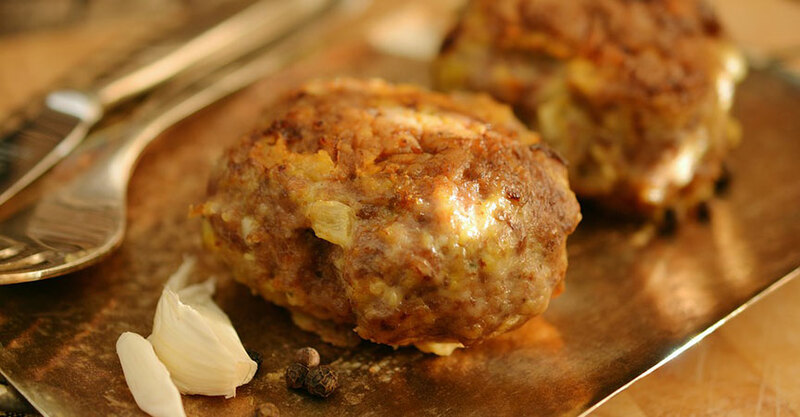 Form into 12 meatballs and place on a parchment lined baking sheet or silk pad. Bake for 20 minutes. While baking toss the tomatoes in the other tablespoon of olive oil with salt and pepper. Remove from oven, flip meatballs and toss in the tomatoes. Bake for another 10 minutes. Serve along with the spaghetti squash.